– Pope John Paul II, The Gospel of Life (Evangelium Vitae), n. 100. 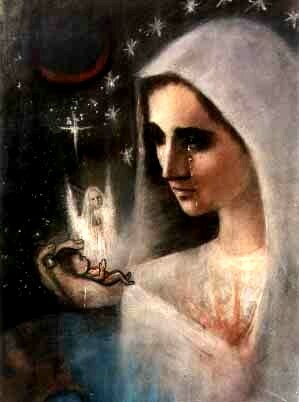 O Mary, Mother of Jesus and Mother of us all, we turn to you today as the one who said "Yes" to Life. "You will conceive and bear a Son," the angel told you. Despite the surprise and the uncertainty about how this could be, you said yes. "Be it done unto me according to your word." Mary, we pray today for all mothers who are afraid to be mothers. We pray for those who feel threatened and overwhelmed by their pregnancy. Intercede for them, that God may give them the grace to say yes and the courage to go on. May they have the grace to reject the false solution of abortion. May they say with you, "Be it done unto me according to your word." May they experience the help of Christian people, and know the peace that comes from doing God's will. Amen. We would now like to say a special word to women who have had an abortion. The Church is aware of the many factors which may have influenced your decision, and she does not doubt that in many cases it was a painful and even shattering decision. The wound in your heart may not yet have healed. Certainly what happened was and remains terribly wrong. But do not give in to discouragement and do not lose hope. Try rather to understand what happened and face it honestly. If you have not already done so, give yourselves over with humility and trust to repentance. The Father of mercies is ready to give you his forgiveness and his peace in the Sacrament of Reconciliation. To the same Father and to his mercy you can with sure hope entrust your child. With the friendly and expert help and advice of other people, and as a result of your own painful experience, you can be among the most eloquent defenders of everyone's right to life. Through your commitment to life, whether by accepting the birth of other children or by welcoming and caring for those most in need of someone to be close to them, you will become promoters of a new way of looking at human life." Struggling or in Need of Prayer? Please fill in the form in the Contact Us section to send your prayer request to the Order of the Most Holy Mary Theotokos. Or, you may simply send an email to our Bishop-Abbot at: DomRobert@osst-abbey.org Your request will go out to all members of the Community and will become a part of our daily intercessions. Please provide us with your first name and some details of your prayer need. We are honored to join you in prayer. big enough for the world.